BoxVPN had a terrible reputation in the past. Hoards of dissatisfied customers complained of a myriad of problems, such as billing errors, poor customer service, and loads of technical problems. But they have recently undergone a change in ownership, leaving many people wondering whether or not this service provider is up to scratch. Today, we are going to pick apart this service piece by piece to help you decide whether or not they’re a good fit for you. To start off, let’s take a look at their pricing model. On the surface, this looks like extremely favorable pricing. But I’m a little wary because it looks a bit like a marketing gimmick. There’s a 70% discount between the monthly subscription and the annual subscription. Who in their right mind would choose a monthly subscription option that’s nearly 3 times higher? To me, it feels like they are trying to manipulate their customers. Also, please be aware that there is no free version or trial version of their service. They do have a 7-day money back guarantee, but it seems to have some problems. Many people have complained about billing errors and failures to get their money back due to poor customer service (as we’ll discuss in a later section). They do accept a myriad of payment options as well, including Visa, Master Card, American Express, Perfect Money, Discover, Bitcoins, and Paypal. I’m a little disappointed that so many users have complained about poor service delivery and bad execution, because they actually have a lot of good features with their software. First and foremost, I tend to favor providers that allow up to 5 (or more) simultaneous connections. Like other providers, they claim they are a completely log-free provider (though they do log metadata) and offer unlimited bandwidth, speed, and server switching. I was a little disappointed with their global coverage, because their network is a little small. They have servers in 22 countries, which isn’t terrible. But the red flag for me is that they only have 80 servers. The big dogs in the industry have hundreds, if not thousands, of servers. There’s a little wiggle room in how they word their server count, especially with the modern prevalence of virtual machines. But any way you slice it, they don’t have high capacity due to their relatively low number of servers. On their landing page, they claim that one of the features of their service is ‘no extra charges.’ In all my life, I don’t think I have ever seen another VPN provider make that claim, which makes me more than a little skeptical. After all, why claim that no extra charges is a feature unless they’ve had some big problems with billing in the past? It shouldn’t even be a feature; rather, it should be a given. Whenever anyone choose to do business with a digital service, it is expected that there aren’t going to be any hidden fees or service charges (unlike the investment industry). On the whole, I think their software and service features have everything most people are looking for. But before you make your mind up, let’s talk about security and privacy. On a happier note, I was pleased with their level of security. They provide some of the strongest encryption protocols available. However, a VPN service is expected to have the strongest encryption protocols. Nevertheless, BoxPN offers secure connections using OpenVPN, L2TP/IPsec, SSTP, and PPTP. Most providers offer PPTP connections, but I’d advise you to refrain from using PPTP with sensitive data. The protocol is outdated, and only offers weak encryption. Believe it or not, it’s possible to break the PPTP protocol to read encrypted data. It’s really only best for gamin and unlocking streaming geo-restricted content, because PPTP has less overhead that stronger protocols. BoxPN certainly isn’t the fastest VPN service. Numerous users have made complaints about a variety of connection problems. First off, users have complained about slow connections. If only one or two customers complained, I would be inclined to dismiss their claims on the grounds that they’re non-technical individuals who don’t know what they’re doing (for instance, they could have extremely slow ISP connections). But when so many customers complain, it starts to create a pattern. In addition to complaints of slow connections, many have also complained of unstable servers. I think this might be due to capacity issues since they only have 80 servers. Many users have complained of packet loss, jittery video streaming, buffering issues, and overall poor stability. It could be that BoxPN will improve their network and servers, but for now, I wouldn’t count on it. I was a little disappointed with their customer support. First of all, they didn’t really have a true knowledgebase. It’s becoming increasingly more popular for VPN providers to have a FAQ page, setup guides, troubleshooting guides, and even a forum to help users sort out their problems before resorting to contacting support. However, BoxPN only has a weak FAQ section in addition to well-designed setup guides. They organize the guides by the protocol and operating system you are trying to configure your VPN on, and include high quality images and simple step-by-step procedures. But they don’t provide a telephone number, and they lack a live chat feature. Instead, they only have a contact form that will send the support department an email to open a ticket. I suppose it’s better than nothing, though, because I’ve even seen a couple providers fail to provide any support at all. However, I would also like to point out that the individual user reviews for their customer support have been awful. Many customers have complained about billing issues, such as trying to take advantage of the money back guarantee and instead being charge for a year’s subscription. To me, this is a big red flag, and makes me think they don’t have everything together internally. The only thing I really liked about their service was the strong encryption algorithms, but any other competent VPN provider is going to offer the same connection options. There are just too many red flags with this provider for me to honestly recommend them to another living soul. When you subscribe to a VPN service, you’re counting on them to safeguard your data. You need to trust their integrity, but there are numerous problems with this service. First of all, they have limited servers and limited global availability. Their service didn’t ‘wow’ me with their features, and I think any other VPN provider will be able to offer the exact same feature set (with exception, perhaps, to the number of simultaneous connections). In addition, there have been too many complaints regarding poor server performance. Few things in life get my blood boiling faster than a slow Internet connection, and it’s a real headache when you’re trying to work, read, study, stream, or download content online. It’s 2016 after all, and most of us have come to expect the Internet to work at the drop of a hat. Lastly, I’ve never seen so many negative reviews for a customer service department, and that’s saying something. Customer service departments (even the good ones) often get bad reviews because it’s a frustrating process to troubleshoot computer problems, especially if you’re a nontechnical user. But their negative reviews weren’t centered around the knowledge of the support staff or their ability to solve problems; rather, the bulk of the complaints were centered around billing problems (yikes!). Don’t let the cheap $2.99 a month annual subscription plan fool you. It’s true what they say, you get what you pay for. 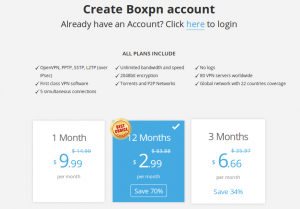 In summary, BoxPN had cheap pricing, a bland set of features, strong security, poor speed and stability, and a horrendous customer service track record. I’d like to steer people in another direction. In my honest opinion, their service isn’t worth it. If you’re looking for another cheap VPN, I might recommend PIA VPN, which only costs $3.33 per month. And PIA VPN has a proven business model, years of success, and a track record of happy customers. Think twice before you sign up for BoxPN.